Who burned the Great Library of Alexandria? 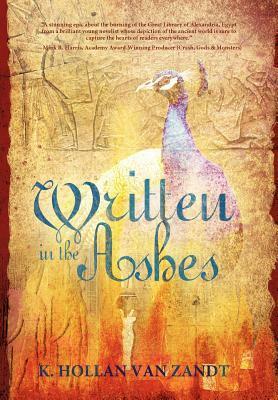 When the Roman Empire collapses in the 5th century, the city of Alexandria, Egypt is plagued with unrest. Paganism is declared punishable by death and the populace splinters in religious upheaval. Hannah, a beautiful Jewish shepherd girl is abducted from her home in the mountains of Sinai and sold as a slave in Alexandria to Alizar, an alchemist and successful vintner. Her rapturous singing voice destines her to become the most celebrated bard in the Great Library. Meanwhile, the city’s bishop, Cyril, rises in power as his priests roam the streets persecuting the pagans. But while most citizens submit, a small resistance fights for justice. Hypatia, the library’s charismatic headmistress, summons her allies to protect the world’s knowledge from the escalating violence. Risking his life, his family, and his hard-earned fortune, Alizar leads the conspiracy by secretly copying the library’s treasured manuscripts and smuggling them to safety. When Hannah becomes the bishop’s target, she is sequestered across the harbor in the Temple of Isis. But an ancient ceremonial rite between a monk and priestess inside the Pharos lighthouse ignites a forbidden passion. Torn between the men she loves, Hannah must undertake a quest to the lost oracles of Delfi and Amun-Ra to find the one thing powerful enough to protect the pagans: The Emerald Tablet. Meanwhile, the Christians siege the city, exile the Jews, and fight the dwindling pagan resistance as the Great Library crumbles. But not everything is lost. . .
A book tour stop from Premier Virtual Author Book Tours. “Hypatia flew down the dais to the back stairs of the hall behind her. At the bottom, she tried the door handles and flung her body against the latch only to find them bolted shut from the outside. She looked around herself, hearing the footsteps of the mob approaching. A light at the end of a passageway off her left shoulder caught her attention. She ran toward it and found a small glass window set above the street. Being merely ornamental, it had no latch, no way of opening. Hypatia turned around looking for something to smash it. Then her eyes fell on a small statue of John the Apostle that had been placed in a niche in the wall. She grabbed it and threw it through the window with a crash. Then she hoisted herself up onto the ledge with muscles in her arms unused to lifting her own weight as the swarm of bodies spilled around the corner of the passageway. Hands clawed at Hypatia’s feet and the leather ties on her sandals snapped. Someone else snagged a corner of her robes as she fell the short distance through the window into the street, tearing them to the waist. Hypatia landed on her hands in the broken glass and rolled before coming to her feet. As swiftly as she could, she raced to her chariot and took the reins in her bloody fingers. “Hyaaaa!” she screamed, smacking the reins on her horse’s neck. The mob streamed out of the lecture hall, followed by the Parabolani. “Then it is time to use this,” growled Peter, drawing a scroll from his robes like a sword. It was a map of the catacombs. Jemir was the first to become aware of the commotion. He was polishing the handle of a long spoon in the downstairs of the kitchen, humming a song to himself, so happy for the new baby, when a sudden uproar in the alleyway behind the stable caught his attention. He set down the rag and walked outside to the gate where a group of men were running past. “What is happening?” Jemir called out. Jemir lifted his gaze to see the black smoke smudging out the stars; an instant later, the unmistakable scent reached his nostrils. “What is it?” asked Hannah. “Where is Gideon? Where is Alaya? And Synesius?” asked Jemir, his eyes filled with terror. But before he could respond, the criers on the street began to scream the news. The library, the Great Library is on fire. Hannah sprung for her cloak and ran down to the kitchen, heading toward the stable. “I do not care! I must find my child.” Hannah whipped around and lunged for the door. She faced him, her eyes two sharpened daggers. The door flew open then as Tarek burst into the kitchen from the courtyard, hurdling Jemir forward. Hannah reached for the door. “Stop, where are you going?” said Tarek. “I must get my daughter,” said Hannah. “Please, Kukla, let me go,” insisted Jemir. K. Hollan Van Zandt has always loved libraries, oceans, ancient history and migrating birds. Her mentor, novelist Tom Robbins, instilled in her an abiding love and respect for language.She lives in Southern California, and dreams of a home in Greece. This, her first novel, took ten years to complete. K. Hollan Van Zandt’s website. 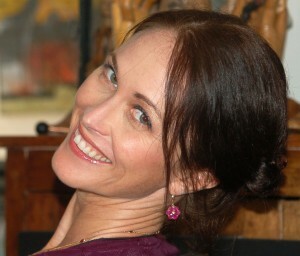 Do you have a question you would like to ask K. Hollan Van Zandt? Please join her new group at Goodreads.com and ask away. This looks all kinds of fabulous. I don’t know how I feel about Christians being represented as being so intolerant, but many were in those days. I think my squick about the representation of Christians comes from the fact that people think all Christians are fanatical a$$hats because all the representations of them in the media are people like Westboro Baptist Church who are abominations to the name of Christians everywhere. I just wish people knew that we aren’t all like that. I know what you mean, I totally agree! A writer form my country, and one of my favorite thinkers, wrote in one of his books something along the lines of “how cruel and unforgiving man must be, for he has projected upon God his own flawed image and humanized Him instead of trying to understand the grace of the divine”. Thank you so much for the win! Super excited about this!